Alltech, a global leader in the animal health and nutrition industry, is headquartered in Lexington, Kentucky, USA and has a strong presence in all regions of the world. The company has production facilities strategically located throughout the world and as such, Alltech has the unique ability to effectively address global animal health issues at a local level. In purpose built bioscience research centres around the world, young scientists work as part of Alltech's expert team of biochemists, microbiologists, chemists and nutritionists to advance animal health, welfare and performance. Each bioscience centre has its own research focus and the work carried out at each individual centre compliments the research at the other locations. Alltech’s European Bioscience Centre located in Dunboyne, Co. Meath was officially opened in 1999 with an emphasis on fundamental research encompassing biotechnology, microbiology and chemistry based disciplines. Since its inception, Alltech has always forged strong links with academic institutes and the Dunboyne facility is no exception to this. With its close proximity to a number of internationally renowned universities, Alltech has formed strong research alliance programmes. In 2013, a year-long expansion project was completed during which the existing facility in Dunboyne trebled in size to 33,000 ft2. The expanded Bioscience Centre affirms the location’s role as the European headquarters in which 120 staff play pivotal roles across sales, research, marketing and financial services. Whilst the principle remit of the Dunboyne facility is to serve as the European headquarters, the staff based onsite play key roles within the global Alltech network. 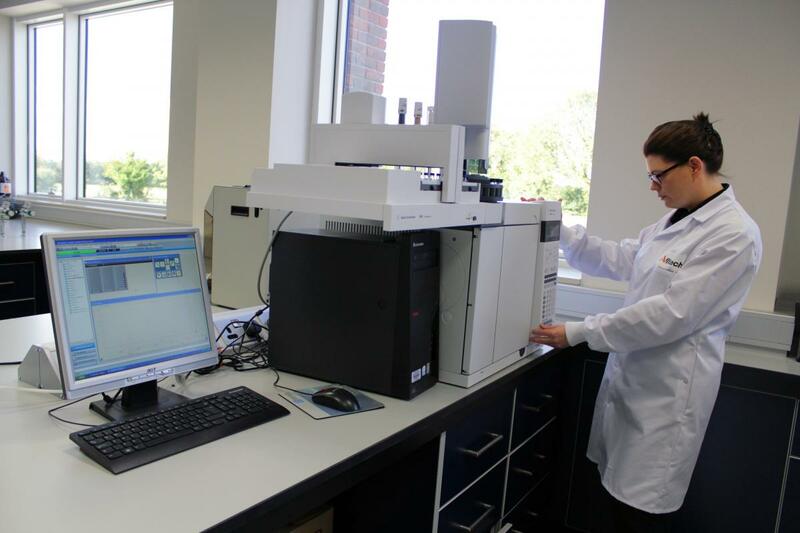 Specialising in diverse areas such as assay development and validation, protein biochemistry, molecular biology, microbial ecology and trace element research, the team of scientists based in Dunboyne focus on the basics behind the range of Alltech solutions. Such fundamental research has resulted in the development of unique insights into specific topics, including organic mineral bioavailability, gut microflora and crop science. In addition to the importance of trace mineral inclusion in the diet, the form in which an element is presented plays a critical role in defining its efficacy. A host of intrinsic and extrinsic factors are known to affect the bioavailability of dietary trace elements including animal species, interaction with other minerals and dietary nutrients, physiological state, chemical form and solubility of the mineral element. The increased bioavailability of organic trace elements and minerals has received considerable attention due to their effectiveness at increasing mineral status. A significant and growing volume of peer-reviewed research has found that the bioavailability of organic trace minerals is substantially greater than when delivered in inorganic form. The mineral research team in Dunboyne is engaged in a number of distinct areas. At a fundamental level, research is ongoing into the identification and characterisation of organic minerals. This research examines factors influencing the structures of both organic mineral chelates and unique synthesised organoselenium compounds. The basis for this work is reliant on the use of advanced spectroscopic techniques, which allow for the detection of unique organic metal species. In addition, molecular modelling enables the research team to assess the likely stability of organic minerals under real world conditions. More recent studies aim to detail the uptake and cellular fate of chelated trace elements and minerals. Through deciphering the key factors that affect their cellular bioavailability we can gain a greater understanding of the influencers of not only their transport but also their rate of uptake. The most advanced research aims to characterise the mechanisms which control the homeostasis of trace elements and minerals. This programme utilises both gene and protein based techniques to gain insights into the control mechanisms, which maintain the finely tuned intracellular mineral balance. The gastrointestinal microflora (the microbiome) plays a pivotal role in nutritional, physiological and immune functions of animals. It consists of a complex eco-system inhabited by a highly evolved community comprising of several hundred bacterial species, whose interplay control health and nutrition. Poor intestinal health is associated with increased pathogen colonisation, susceptibility to infectious disease and ultimately leads to poor weight gain and increased mortalities. Profiling and understanding the role of intestinal microbial communities is important for the development and understanding of new and existing feed additives, thus allowing the manipulation of diets to improve performance, health and welfare. Dietary supplements, which focus on stabilising the gut microflora to aid intestinal health and decrease the animal’s susceptibility to disease, can be broadly classed as either prebiotics or probiotics. The microbiomics research team at Alltech’s European Bioscience Centre focuses on identifying the population modulating effects of dietary supplementation with yeast cell wall based prebiotics. Through the use of advanced DNA sequencing-techniques, difficulties associated with cultivating intestinal bacteria have been overcome and this has provided detailed insights into the fluid nature of the microbiome. The practical application of this information is a key goal of the research team and by working with isolated yeast cell wall fractions, newer studies at Dunboyne have focused on the effects of dietary supplementation on the overall bacterial community of the poultry gut. Such work has shown that supplementation can significantly alter the intestinal microflora. More strikingly, consistent alterations in specific components of the caecal microflora of broilers have been identified with alterations also noted in numerous biological pathways as a result of supplementation with isolated yeast fractions. The most recent work by the team at Dunboyne has examined the area of antibiotic resistance. One strategy to reduce or limit the use of antibiotics is to find ways to make them more effective and the use of yeast cell wall fractions has been shown to enhance the sensitivity of bacteria to the effects of antibiotics. In the long term, such findings will have significant practical value in commercial production settings. The provision of natural-based solutions to the agronomic and horticultural challenges facing producers worldwide is the goal of the crop science research programme at Alltech’s European Bioscience Centre. By utilising yeast and yeast derivatives, the programme offers a viable alternative to conventional agrochemicals. The research team realises that successful agronomic practices are a balancing act between meeting the consumer demand for fewer chemicals and difficult weather conditions, while attempting to increase yields with fewer resources. By optimising field and crop health, the team aims to deliver solutions to the nutritional health and performance challenges facing crop producers worldwide. A fully integrated crop and soil research programme has been initiated on-site in which 50 hectares of prime agricultural land is currently utilised for field based soil and crop studies, with subsequent follow-up using the extensive cellular biotechnology facilities in the newly expanded research laboratories. This allows for a full overview of not only the macro, but also the micro, effects of using Alltech Crop Science solutions on soil and crop production systems.